Fran over at Curiosites Esthetiques has kindly blogged about our upcoming Harry Potter Tribute Art Show. You can read about it here. She is also hosting a Harry Potter button set give away in which two sets of our eight original-designed buttons will be given to those who comment on her post with your favorite Harry Potter artist submission. Be sure to participate and swing by Nuclues for the Harry Potter Tribute Art show opening on July 9th at 7pm. Prize of the Day: LIMITED EDITION TOY 'FROSTBITE'!! Thanks so much for joining in the fun of our CATCH A CRITTER contest! Nate Wragg has contributed a few more works to his LOCALS exhibit viewed here. The work will be on display in the gallery through July 3rd (Nucleus will be closed on July 4th). A previously featured artist at Nucleus, Brittney Lee, freelance animator, designer, and visual developer, is perhaps best known at Nucleus for her cut-out illustrations. Her works tend to be playful and innocent in atmosphere through her use of cheerful colors and her ability to convey light human expressions. The result are delicate pieces that seemingly draw upon the warmth of memories from childhood. Southern California painter and illustrator, Catia Chien will be among the thirteen featured artists of Nucleus' exhibition, Baker's Dozen. Dispalying great range, her works sometimes convey deep and heavy climates through the layering of lush colors, and other times, a more light and airy approach as characterized by feathered brush strokes. There is always an energetic current that underlies her illustrations. Her childhood began in Sao Paulo, Brazil a culturally-rich environment, where she spent her time watching insects and daydreaming. Perhaps these experiences paved the path for this up-and-coming artist. 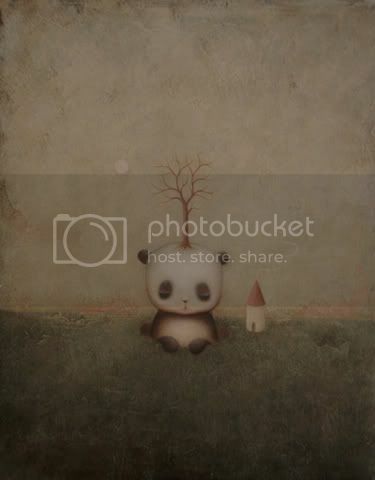 There is certainly something sincere and innocent through which Chien chooses to illustrate her children characters,. Their movements and reactions to their often wondrous and fantastic surroundings are marked by a sincere and playful curiosity. 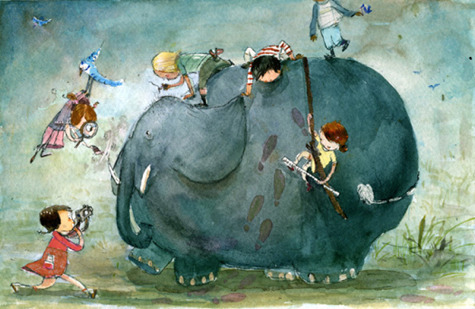 Chien's illustrations have been featured in children's books as well as other independent publications. She has also worked with Nickelodeon and Automatic Pictures. Nucleus' Baker's Dozen show begins June 11th and lasts until July 4th. Nevada based artist, Ahren Hertel, is one of thirteen artists featured at Nucleus' current exhibition, Baker's Dozen. Known for his surrealist paintings, Hertel seamlessly blends the cartoonish with the real, the strange with the ordinary, resulting in intimately captured vignettes that straddle the divide between both dream and reality. Despite his interest in the fantastic, Hertel often grounds his paintings within a near-believable reality through his portrayal of photo-realistic figures. Portand based artist, Matte Stephens creates gouache illustrations characterized by sharp edges and straight lines rendered in loose fashion. 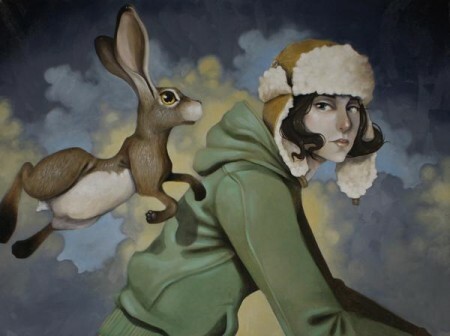 Despite his use of earth and industrial-like tones, Stephens' pieces carry a light and playful atmosphere, often depicting the interactions between people and animals in both formal and pedestrian settings. Stephens is featured in Baker's Dozen exhibition currently on display. ..with today's Critter prize, 'Local Drifter,' this one-of-a-kind original artwork by Nate Wragg!!! Next and LAST round of winners will be announced on June 28th! This charming, hand-painted toy was meticulously crafted by the artist himself and comes with a print. Wanted to share the newest Harry Potter trailer just released today! A regular at Nucleus, You Byun, makes another appearance, this time exhibiting with twelve other artists in Baker's Dozen running now through July 4th. She has quite a well-cultured background, her youth spent traveling between the US, Japan and Korea, and her BFA in graphic design earned from Hongik University in Seoul. 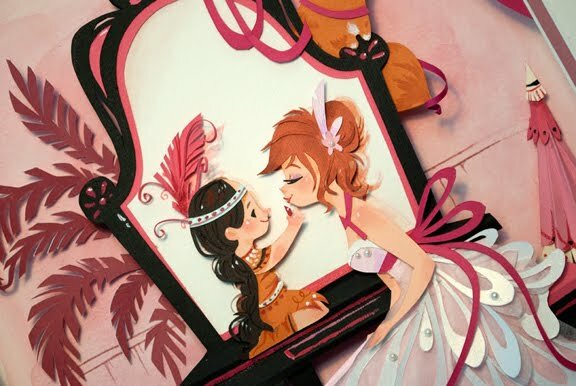 She later graduated from the School of Visual Arts in Brooklyn, and has since become a masterful illustrator, creating imaginative worlds filled with young girls, curious monsters, and flourishing environments, all of which are encoded with lush pastel colors. Her works are reminiscent of childhood, managing to capture the allure of curiosity and innocence, a quality achieved through intuitive mark-makings and characters drawn from youthful imaginations. In today's spotlight, Byun answered some of Nucleus' questions. N: What do you hope to communicate to your audience? YB: I'd like to give them some cheerful messages - or happiness, hope, and peace. N: How has your work evolved or changed in the last 5 years? YB: My work is still very decorative and busy though, it actually has became more simple. N: What was your proudest moment? YB: I guess I should be honest.... When my mom said she is proud of me. Or when she says I'm a genius painter (fyi - she didn't study art). Byun's projects have included editorial assignments for magazines Plan Adviser, Plan Sponsor, and Society of Children's Book Writers and Illustrators. Her work has been featured in Communication Arts, Creative Quarterly, AI-AP, and has won acclaim from the Society of Children's Book Writers and Illustrators and Tomie DePaola Illustrator Award. N: What is your earliest memory of making art? YB: I don't remember how old i was, probably age 3, but i remember i was drawing a purple faced people with crayon. Where do you turn to for inspiration? – Books, Essay, articles and conversations with people. N: Ok, here's something fun..what would be your dream project? If you could do anything with an unlimited budget? YB: Oh I want to make an amusement park!!! With forest, animals, creatures, flowers, snowflakes, candies, butterflies, clouds, ....lists go on. Maybe no riding machines, more like a huge camping space - I want to built a fantasy land. N: Sounds fun! Now something silly, list 5 things, random musings/ facts/ etc. you think we should know. I like tea. White tea is my favorite, but I like Genmaicha as well. Recently I am into Black tea with soymilk. I like to draw murals someday. I'm not one of those cool street artist - so, let me draw if you have a wall! I get depressed if I 1) don't drink enough water, 2) don't go out for a whole day, and 3) don't dress up nicely (and of course, it's very personal perspective). I should be more tidy. I should eat less chocolate. 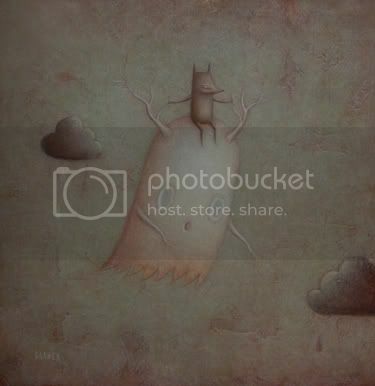 Be sure to check out Byun's latest illustrations during the Baker's Dozen exhibition running now through July 4th, 2011! I hope you held on to your CRITTERS, because we have more dates just added (below) with some really fantastic new prizes! On the dates below, we will announce 10 winning numbers on the Nucleus Blog, Facebook, and Twitter promptly at NOON (PST). If one of the winning numbers matches your raffle number found on the back of each critter card, contact us immediately: 626-458-7477. The first person to call us will be awarded the prize of that given day. Prize of the Day: ORGINAL ARTWORK!! Nucleus is growing our team and we are on the search for a new Store Manager. For All of You Critter Lovers! Frostbite is the first in a series of Limited Edition Toys designed by Wragg and inspired by his solo exhibition LOCALS, opening TONIGHT (Saturday) at 7 P.M.! This toy also comes with a Limited Edition Wood Block Print. Both the toy and the print are signed and numbered by Wragg. You can pre-order your Frostbite tonight at the opening reception of LOCALS, there are only 100 available! 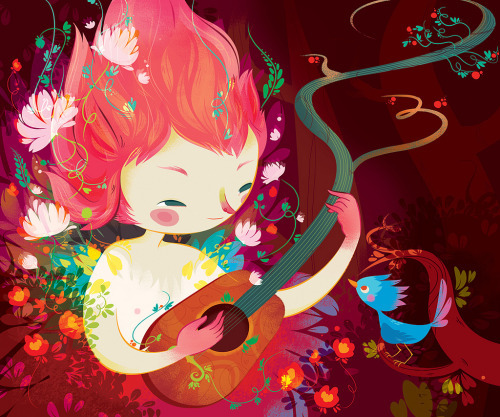 You can also pick up this bright, playful print for $30 and have it signed by the artist! This print references one of Wragg's originals that will be featured in the show; it is the artist's largest work to date. Hope to see you at the opening tonight...should be a blast!!! Congratulations to Lauren! We had multiple calls back to back, but she was the very first one! Thank you all for participating! Nate Wragg's opening is just HOURS away now and....it's time to announce more winner's in todays' Critter Contest! This brand-spankin-new-just-released Nate Wragg print plus a $25 Nucleus Gift Card. Nebraska based artist, Nicole Gustafsson, joins Nucleus' upcoming Baker's Dozen exhibition, showcasing several of her imaginative nature themed illustrations. Gustafsson was born and raised in Norfolk, Nebraska where much of her youth was spent playing in her treehouse and the park across the street from the family home. These outdoor adventures helped form Gustafsson's love of nature and fueled her imagination. It is this sense of adventure and discovery that is conveyed in her work. In this brief Q & A with Nucleus, we learn more about her inspirations. N: One motif I noticed are the dwellings and homes of your woodland characters, does this have a particular symbolism? NG: The sense of "home"- a place to call your own and share with loved ones is very important to me. I love seeing peoples houses (in particular artists studios) because it reveals a lot about who lives there. What kind of artwork people choose to display in their house, how they organize their papers, and what types of plants people tend to is very interesting to me, I try to utilize these little clues in my artwork to inform the viewer about who the inhabitant is. Treehouses in particular are very dear to me because my dad and I built one in an old crab-apple tree in our backyard. This place was very wonderful to me and it was without question "my space" growing up and a very imaginative place to hang out. This sense of space I felt in my treehouse growing up, is focused in my paintings as various dwellings and tree structured homes. 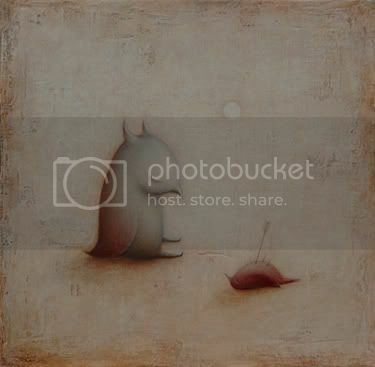 Gustafsson opts to paint creatures as the inhabitants of the dwellings rather than people as animals can be ambigous, and thus more relatable -they can remind you your best friend, kids, or neighbor from years ago. Gustafsson's illustratve works also often feature plants and trees, their depiction often rendered through soft colors and intricate patterned lineworks. There is a particular quality found in these pieces, a whimsical and fanciful spirit not unlike the tones set by fairy-tales. N: Who are your influences? Where do you turn to for inspiration? NG: One inspiration that I keep coming back to is Ukiyo-e Japanese prints. The color pallet, outlines, and wonderful imagery is something that resonates with me. I also really enjoy following other artists blogs, seeing process pictures and insight into their creations. Some of the artists sites I follow are Jay Ryan, Mall, Corey Godbey, Jaw Cooper, Brendan Monroe, Israel Sanchez, and lots more. It's fun to surf while waiting for paint to dry! Care to challenge Nicole in Super Mario Bros? In her own words, some interesting tidbits about her likes and dislikes. I Love succulent plants of any shape and size. I always feel compelled to take a nap under the shade of a tree. I can beat Super Mario Bros in 11 minutes, but really stink at playing Donkey Kong. My favorite candy right now is Gummy Bears. I just finished reading the Percy Jackson series by Rick Riordan and loved it! Critter Contest Winners Round 2! TODAY'S PRIZE IS A 'YETI' print signed by Nate Wragg + Nucleus T-shirt (your choice). TUNE IN for our next round of winning numbers on June 11th, the opening day of Nate's first solo exhibition LOCALS. Lorena Alvarez's illustrations often consist of flush and vibrant colors, a diverse palette that reflects an overwhelming sense of optimism and joy. Based in Bogota, Columbia, Alvarez's work has received great acclaim, having been featured in magazines, children's books, independent publications, and advertisement. More recently, she's one of 12 artists exhibiting in Baker's Dozen which opens this Saturday. In a brief interview with Nucleus, we had a chance to gain a little background on this amazing artist. From the moment she received her first crayon, Alvarez immediately began doodling across the walls, a sudden awakening to her creativity. Her parents, perhaps realizing their child to be gifted, purchased her a set of watercolors, and thus her journey as an artist began. A year later, after the birth of her sister, Alvarez, like many children, took interest in the idea of a baby within another human being, and began to create drawings that reflected this concept, filling all her notebooks with monstrous dolls with people inside. Of this she notes, " I was trying to explain myself how could that be possible. I wouldn’t dare to say that I was making art then, but the urge to express the way I see things was always there." As Alvarez began to develop as an artist, she began to search for a variety of source material, and often found herself drawn to comic books and animated films. Her works certainly depict the cartoonish and illustrative elements associated with these two mediums. 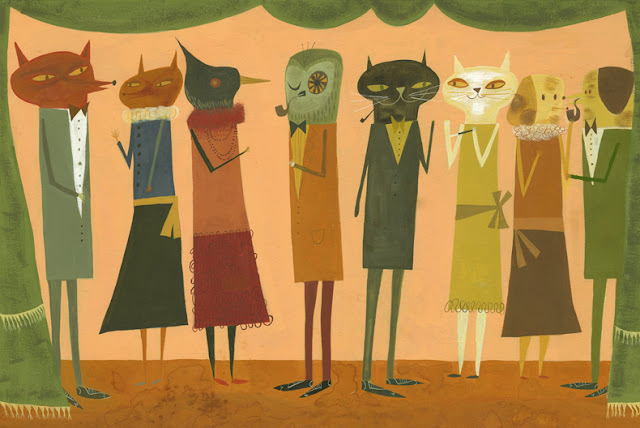 She also gained inspiration from artists such as James Jean, Mary Blair, and Lou Romano. She also looks to fashion, photography and the performing arts, explaining " I’m more and more interested in exploring the expressiveness of movement and color." She adds that listening to music and traveling are also meaningful experiences as well as good jokes and the company of friends. Using these inspirations, Alvarez has slowly evolved as an artist, and over the past ten years, has managed to develop her voice within the art world, one not limited by boundaries of style. She sees her portfolio as a work-in-progress, a part of her identity that is constantly changing to reflect her own growth and confidence. "10 years ago you could see in my high school notebooks lots of big-eyed anime warriors and princesses. When I got into college I discovered many European and American comic artists and illustrators and began to explore with photography and traditional techniques...if I had to compare my work now with the things I did 10 or even 5 years ago I can say I feel more confident using color and dynamic compositions." As of now, Alvarez states that her proudest moments was when she was accepted into the Graphic Design School at the National University, as her acceptance confirmed that she was following the right path. She also beams with pride about her work with puppets and fellow puppeteers in 'La Procesión,' for it's through this passion that she has overcome stage fright. I’m part of an experimental puppetry group “La Procesión Puppet Club” formed by illustrators, visual artists and animators. I’m a puppeteer and I paint some of our puppets. We are rehearsing for a new show these days. I have my own dance movements, to hide the fact that I can’t dance. I sing silly songs to the people I love. I’m learning to play guitar. My favorite colors are turquoise and purple. In a previous post on Dadu Shin, we briefly introduced you to this emerging talent, and we just can't get enough! Luckily for everyone, Shin has created 6 beatifully rendered, and unexepectidly witty works for Baker's Dozen, opening this Saturday June 11. At only 22, Shin's work exudes a sophistication beyond his years, and is already garnering much acclaim through editorial work. However, like any young artist, Shin is still experimenting and learning to solidify his 'voice' in the (illustration) field while striving to create work that is not only aethetically beautiful but conceptually strong. DS: In elementary school we had to do a project on birds of prey. We had to include pictures or drawings. I drew birds for days. It was awesome. N: Who are you influences? or where do you turn to for inspiration? DS: In terms of illustrators who influence my work I would say that they change every month. 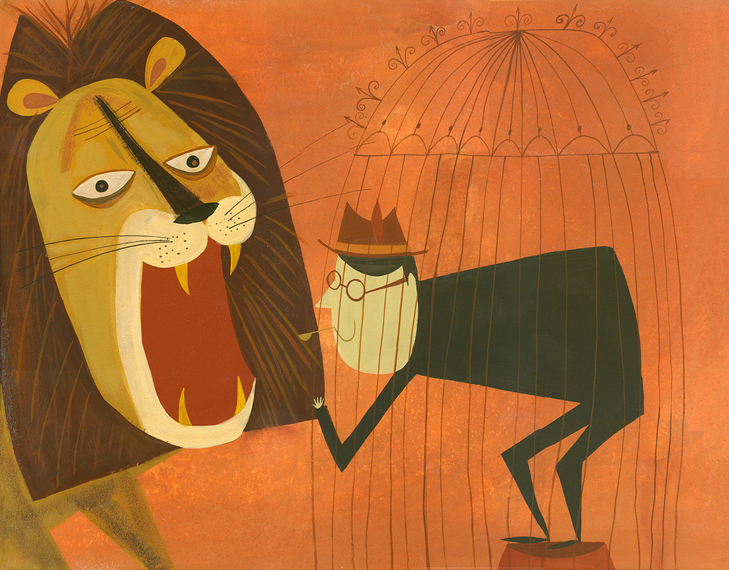 These days I've been studying the old Disney artists and people like Charley Harper. They are simply amazing visual storytellers. As for inspiration I've come to understand that turning to illustration is not a good idea, for me at least. Before a year and a half ago, when I was stuck on a project I would look at a lot of illustration and then start working, but that was a mistake. I ended up being to heavily influenced by the things I had just seen. It wasn't on purpose, it's just what was in my head at the time I put pencil to paper. Process and the real world are what inspire me these days. Paying attention to process is great because when working I always find something that will making think "Oh, I kind of like that, got to try that in the next piece." Experimenting is a big part of that. By the real world, I mean things that simply exist. There are a lot of crazy things on this planet, natural and man made. I see these things and love thinking about how I can incorporate them into my world. So to stay inspired now, all I have to do is keep on making new work, and keep on keeping my eyes open whenever I walk, drive, swim, or fly from point A to point B. Laziness is the only enemy now! N:How are these works in Baker's Dozen different or similar to your other works? DS: The work is a bit different because although I feel like the ideas are all still very me, the techniques and execution is varied. In my sketchbook I use many different kinds of "styles" and in a way I see these as finished sketchbook pieces. N: What has been your proudest moment so far? DS: When the amazing SooJin Buzelli hired me to do the cover for PLANSPONSOR. It was basically my first real illustration assignment. I was extremelyexcited and extremely nervous at the same time. I had also submitted two pieces to her before that were both rejected. Failure followed by success is even better then just success. She was also number 1 on my "art directors I want to work with" list at the time. DS: Hmm this is hard to answer because I love collecting quotes and I'm always referring to them for advice or inspiration. One good one that I think everybody should always keep in mind is: "The core skill of an innovator is error recovery not failure avoidance." I heard this one listening to Randy Nelson from Pixar. DS:...to do what you want to do and not what you think someone else wants you to do. Whenever I see little kid drawings, I always think they're way better then anything I've ever done. Kids are so care free and imaginative when they draw. I grew up on the East coast and love it, but I always wanted to live in California. I'm incredibly inspired and a tiny bit scared that there is so much amazing talent out there. I don't really know where my name comes from. Apparently my name means a lot of random things in different languages. It is also an ice cream company. Update: We have a winner....CONGRATS MAGGIE HSU!!! Now through the month of June, on select dates, we will be announcing 10 randomly generated numbers. If the number matches your critter, give us a call 626-458-7477. First one to call us WINS. Today's winner will receive " A Bad Week" print + A Nucleus t-shirt of your choice. TUNE IN on June 9, for our next round of winning numbers! PB: When i was was 5 years old, my mum and I went to live in my grandparent's attic. My grandmother was an amateur, naive oil painter and I used to love watching her paint. She also had a wonderful collection of books and encyclopedias in her library which inspired me to draw. I spent a lot of time copying images from the books on folklore, mythology, UFO's, magic, spirituality and nature. My favourite book was the Readers Digest book of Folklore, Myth and Legend which I now have in my own collection. My grandmother used to take me to the art school every year and told me that one day I would study there and when I was about 9, my mum bought me a big book about horror, and well, that was my fate as an artist sealed! Barnes left school at the early age of sixteen to pursue his interests in arts, he eventually earned a degree in illustration and graphic design from Gray's School of Art in Scotland. Since then, Barnes has made a career out of painting, but notes that his desire to paint is fueled his passion rather than financial gain. N: At what point did you realize making art was a viable career? Is it? PB: Hmmm, I don't think I ever have, in terms of making a decent living financially. I've never looked at my painting as a career, and it may sound corny, but it's just something I HAVE to do, no matter what. You just have to keep up the faith that life will allow you to continue painting through the financially tough times. And if you are 100% committed, it will. I feel that painting as a career option is secondary to just painting out of pure passion. Despite having elements conducive to a narrative, Barnes states that his works do not align themselves with any particular story or meaning. Instead, Barnes seeks to create a kind of interpretive nostalgia, a feeling for the past that can only be determined by the audience's own intuitions. Currently, Barnes is continuing to progress as an artist and family man, his proudest moments being his children and his first solo shows in the UK and the USA. I've never owned a cell phone. I still live in the 80's. I want to grow my own vegetables. Thanks Paul for providing a glimpse into your world! Be sure to come by Nucleus Saturday June 11th, to see Barnes' work as well as many other fantastic artists in Baker's Dozen. So basically, Jessica Hische is a design powerhouse. Surely you've seen her Should I Work for Free? flowchart and her Daily Drop Cap project! Below are her letterpress prints for Illustrated Type, which are nothing short of amazing in person. Alphabirds is still available for purchase, and some of her letterforms are still up for grabs. See them all before the exhibit comes down on Tuesday, June 7th! Gentle Giant Studios returns to Nucleus for the Harry Potter Tribute Art Exhibition, this time bearing surprises that you won't want to miss. 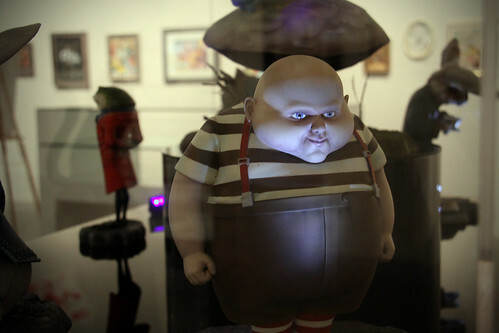 For those unfamiliar with Gentle Giant Studios, they previously showcased with Nucleus' past art exhibition, "Curiouser and Curiouser", indulging audiences with maquettes modeled after the character designs from Tim Burton's Alice in Wonderland film (seen below). The models were flawlessly created, capturing every speck of minute detail in most perfect form--these were truly a sight to behold. Expect something just as amazing. Here's a little teaser to satiate your curiosity in the mean time. The Harry Potter Tribute Art Exhibition begins on July 9th. Rome based illustrator Daniela Volpari creates playful and charming drawings, often narrative scenes, characterized by bright friendly colors and erratic and exaggerated shapes. She will be one of thirteen artists featured at Nucleus' Baker's Dozen exhibition. DV:I remember a drawing made to kindergarten, I copied a picture from a newspaper. I was very young (Approximately 5 years), but I fondly remember the amazement of the adults to see that plan (which in their opinion) was identical. I thought, 'how is easy surprise the adults! From the encouragement gained through her achievements she went on to graduate from Rome's International School of Comics. DV:Often making art isn't profitable. Sometimes you're lucky, sometimes not. Sometimes you have to make compromises and sometimes not. I am optimistic and every time I cross my fingers. I have confidence (too much?) in the quality of my work. N: What has been your proudest moment? DV: When I was selected for the first time in a contest drawing. It was the first time I took part in such competitions and also the first time that I was trying to get in this world. When I was selected I was given the charge to continue, and made ​​me realize that I was able to do so. While the content of her works often revolve around stories, Volpari is more concerned with establishing atmosphere and mood. She hopes to convey feelings of serenity, bliss, and playfulness, always aiming to make her audience smile. Like any artist, Volpari has her own quirks and lessons, luckily she shared a few of them with us! After lunch, I drink a cup of coffee, and after it a great chocolate. Good humor is made of little things. Our feelings are transmitted on the paper. The thing I like about this job is that every day I could receive commissions from all over the world. I love Internet. I am very embarrassed about the compliments made in person. I turn red as a ripe tomato. Often, when I attend shows and events around Rome, I pretend to be a visitor. I understand that sincerity and humility helps a lot in this (field of) work. There isn't reason to quarrel and envy among colleagues, as there isn't a reason to invent a curriculum that doesn't exist. Your art and your talent speaks for you. Listen to good music while you paint. Thanks Daniela! Be sure to swing by Nucleus between June 11 and July 4th to see Volpari's works during the Baker's Dozen exhibition! We Are Matik is a collective of designers in LA. Born out of the age of recession, they craft brands, products, spaces, and experiences that activate the senses and open up brand new states of mind. Matik's manifesto: "We believe that another word for creativity is courage: the courage to initiate change, the courage to enter uncensored territories, and the courage to keep a playful heart in an overly serious world." 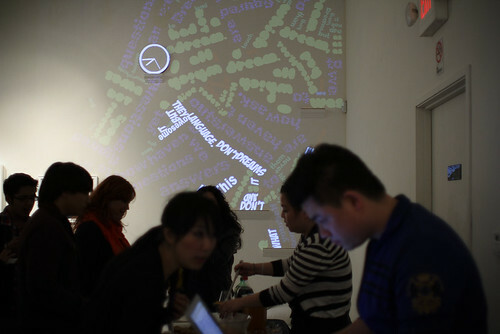 If you were at Nucleus on opening night, you definitely would have remembered Matik's AWESOME interactive installation. 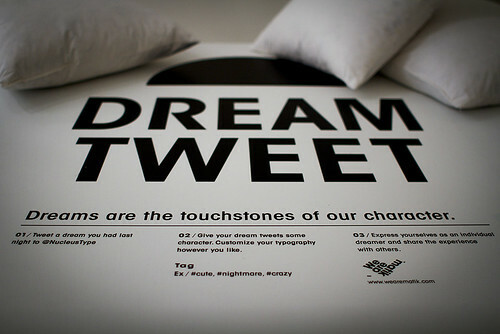 Below are images from their dream tweet corner in Illustrated Type. Matik also designed Connie Lim's ramp for Line of Style, as well as the graphic runway for Sweet Streets II. Be sure to check out past projects (along with sketches, process, and videos) on their website! A graduate from the Rhode Island Institute of Design, Dadu Shin is an up and coming artist that demands attention, identified by his poetically whimsical drawings of scenes involving vivid landscapes and fantastical creatures. His drawings exude a particular calmness, an atmosphere achieved through the thoughtfully simple renderings and spacious compositions. Shin often works in digital, but Nucleus' upcoming show, Baker's Dozen, will feature some new original works that will show off the artist's handiwork. Can you figure out the idioms being illustrated in these following process sketches? Be sure to come in on June 11th to view Shin's finsihed works! With his first ever solo exhibiton LOCALS looming in the horizon, artist Nate Wragg has been busy rounding up all sorts of critters and spirits for a very fanciful gathering on Saturday, June 11! Now, you can be a part of the fun by catching your own critter for a chance to WIN some great prizes! Catch a Critter! On the dates below, we will announce 10 winning numbers on the Nucleus Blog, Facebook, and Twitter promptly at NOON (PST). If one of the winning numbers matches your Critter #, contact us immediately: 626-458-7477. The first person to call us will be awarded the prize of that given day. Where can I catch a Critter? Nucleus of course! But you can also find them at select places throughout Los Angeles such as Golden Apple on Melrose, Meltdown Comics, and the Secret Headquarters while supplies last. What do I do if I have the winning number? Immediately call 626-458-7477. The first person to leave a message with us is the winner. Once we confirm your winning number, you will be awarded the prize. Prize of the Day: A Bad Week print signed by Nate Wragg + Nucleus T-shirt ( your choice). Prize of the Day: YETI print signed by Nate Wragg + Nucleus T-shirt (your choice).